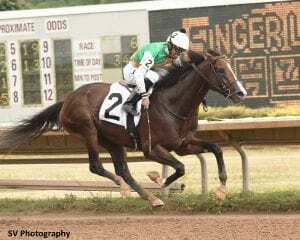 Following a stellar five-race juvenile campaign in which he never finished out of the exacta, Waterville Lake Stable's homebred Sea Foam was still looking to hit the board in his third start of the year. All that changed in one-minute, forty-six seconds and change on Saturday afternoon – the time it took the Medaglia d'Oro colt to wire the 2018 edition of the 1 1 /16-mile $150,000 New York Derby at Finger Lakes. In back-to-back Aqueduct starts last fall for trainer Christophe Clement, Sea Foam broke his maiden and captured the Notebook Stakes. He returned to work this year on May 28 on Showcase Day. That day he finished a wide-trip fourth in the Mike Lee Stakes to Analyze the Odds, who was destined to be his main rival in the New York Derby as the heavily-backed 3-5 post time favorite. On July 4, Sea Foam stretched out to a mile and gave the turf a try in the open $100,000 Manila Stakes at Belmont, where he finished fifth. Typically a stalking type, Sea Foam changed tactics for the Derby under jockey Jaime Rodriguez and went right to the lead from post two. The bay cruised through early splits of 24.68, and 49.29, pursued a length back by Spectacular Kid, Retonova and Analyze the Odds. Spectacular Kid held on for second, followed by Analyze the Odds, who had spotted his rivals six pounds for his first two-turn race. Completing the order of finish were Irish Valor, Ben Z Rolls and Retononva. Andy Hernandez on Spectacular Kid lodged an objection against Rodriguez on the winner, but it was not allowed. From three wins and three seconds in eight starts, Sea Foam has earned $236,070 and is a two-time stakes winner. Foaled at Berkshire Stud in Pine Plains, the colt is out of Kentucky-bred Strike It Rich by Undbridled's Song, who was purchased by Clement for John Meriwether's Waterville Lake Stable for $350,000 at the 2008 Saratoga select yearling sale. After going on to become a graded winner before retiring to broodmare duty, Strike It Rich has produced a pair of winners from three starters. She currently has a juvenile filly by Kitten's Joy named Kerry's Ring who has not yet started, a yearling filly by Giant's Causeway, and foaled a colt by Hard Spun foal on April 7, 2018. This entry was posted in Racing and tagged Christophe Clement, finger lakes, Jamie Rodriguez, medaglia d'oro, new york derby, sea foam, unbridled's song, waterville lake stable by Press Release. Bookmark the permalink.